Stagnation and Lives Worth Living. My wound has stagnated. It has not gotten worse nor has it gotten better in four weeks. My life, as a result, remains on hold. I sit in my wheelchair as little as humanly possible. When I sit I am always on the clock. How long have I been sitting up occupies my mind. Each and every transfer I make is done as carefully as possible to avoid any torque on my skin. I look at my skin daily. I read about wound care online. I watch You Tube videos about wound care. I have changed the type of dressings I use on my wound. I never go out alone. I am dependent upon my son and a friend who drive me to and from school. I do so to save time and remarkably miss the bus. Each and every second I sit is reserved for something important. I do my level best not to sit up for more than two hours. The impact this has had on my mind and spirits is overwhelmingly negative. My wound is glacially sucking the life out of me. Drop by drop my spirits sag into an abyss. Since Thanksgiving I have been unable to sit without angst. One bad fall on the wound I had in 2010 has derailed my life. The wound is very small. It has no depth. It is smaller than a dime. If I were not paralyzed my wound would be insignificant. Young is spot on. The question in the back of people's minds when they encounter a person with a disability or think about a host of disabling conditions never changes. It is basic and demeaning "Is disability a fate worse than death?" In part, this ever present question is why I remain a staunch opponent of assisted suicide. The professionals charged with caring for my body wonder in the back of their head if I should be alive. Philosophers find this question fascinating. There are days it seems as though everyone wonders if my life is worth living. 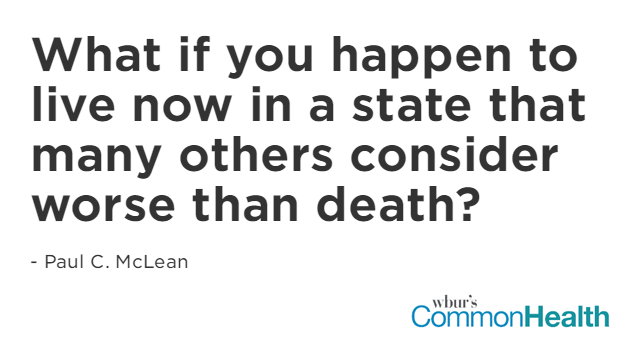 Sadly, it is impossible to get away from the question is disability a fate worse than death. This ableist trope is built into the fabric of society. It is impossible to escape the many varied negative assumptions made about disability. It is akin to a woman trying to ignore gender inequality or a black person trying to pretend racism does not exist. The difference for people with a disability is that our voices are not heard. Our civil rights are violated on a daily basis. There is no social mandate to support disability rights laws. This is done in the most cavalier way. I hear "I am sorry" all the time when I come across needless physical and social barriers. The sorry is not sincere. It is always thought to be a one off. Sorry you can't get in, sorry you can't get on the bus, sorry you can't get in a building, sorry there is no accessible table to sit at, sorry there is no accessible bathroom. The key word here is you. It is always you, you, you. Conspicuously ignored is that there are millions of people like me. We cripples exist. We exist in a world that is hostile to our existence. A few illustrations, I hope will suffice. The curent president of the United States openly mocked a disabled reporter. Peter Singer, a so called moral iconoclast, and undoubtedly the most well-known philosopher today told fellow philosopher Eva Kittay, whose daughter has a severe disability, that she did not differ too much from a pig. He said this to her directly at an academic conference. 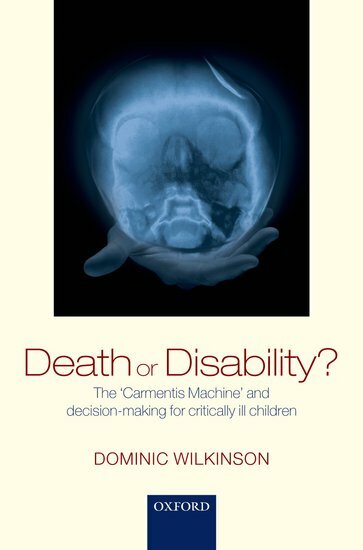 Dominic Wilkinson published a book entitled Death or Disability? 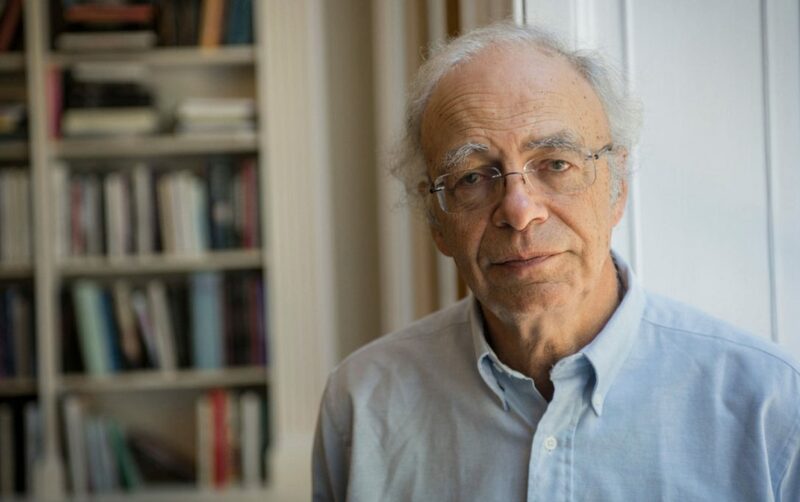 Like Peter Singer, he too wonders about the quality of life we people with a disability may or may not enjoy. 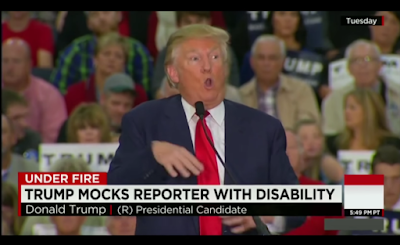 Unlike Singer, he does not compare people with a disability to pigs. However, he had no qualms about the title of his book. Perhaps he assume people with a disability can't read. For when I bought his book, put it on my work table I could not bring myself to open it. I could think of just one thing: does this man think I would be better off dead? More to the point, how does this question affect the pre mature infants he treats as a neonatologist? Here is the front page of the British newspaper, Daily Mirror. 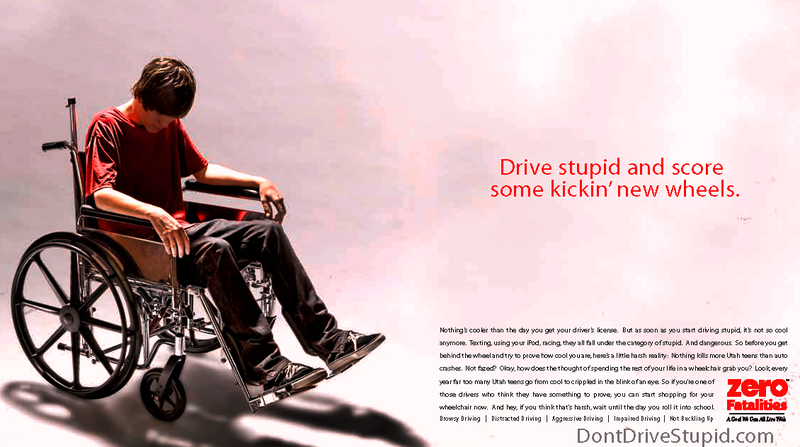 Clearly, using a wheelchair is a fate worse than death. 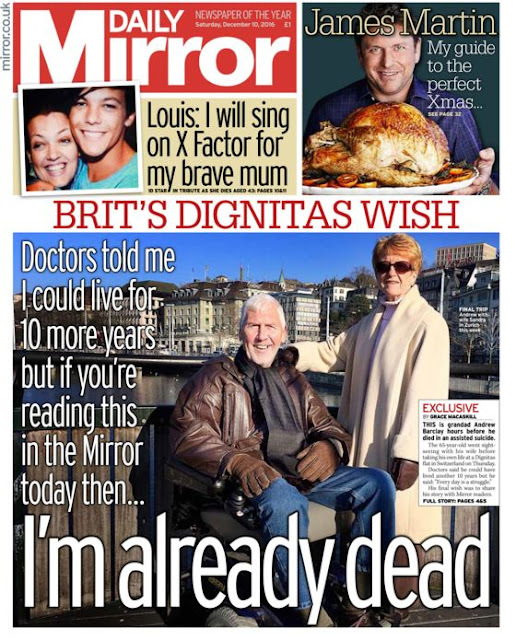 This man's quality of life was so bad that death via assisted suicide was preferable to 10 years of disability. Disability is also effectively used to raise money. The below was part of a slick and edgy fund raising effort for Toronto's Sick Kids Hospital. 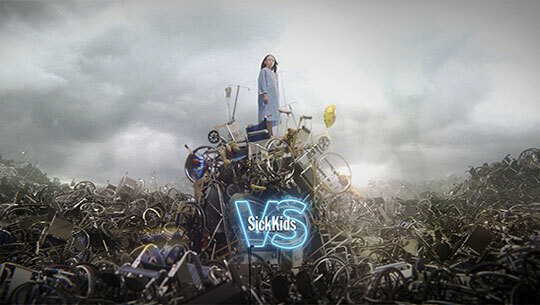 A child stands atop a pile of wheelchairs in victory. The child has clearly avoided an apocalyptic life. Hollywood has a long history of answering the question is life with a disability worse than death. The answer is an emphatic yes. Killing disabled characters sells in Hollywood and insures box office success. This past summer people flocked to see Me Before You. In this disability snuff film the main character, Will, handsome, wealthy beyond imagination, and asexual decided death was indeed preferable to disability. The tag line for the film was Live Boldly. Apparently this only applies to those without a disability. Disability is clearly a tragedy. Disability is often used to invoke fear as this Utah drunk driving campaign. Those that live without a disability blithely walk into health care settings with one concern in mind: getting better. When a person with a disability accesses health care they do so warily. Will a physician I have never met decide my life is not worth living? What sort of inappropriate assumptions will be made about the quality of my life? When it comes to mundane issues a person with a disability must navigate to end of life issues--health care professionals are asking all the wrong questions. We people with a disability are eager to engage health care professionals. Our quality of life is threatened but not by our dysfunctional bodies. What we people with a disability cannot do is easily discernible. What is only rarely thought of is what can we do? The answer to that is simple--we are world class adapters. We are wildly creative in adapting to atypical bodies and navigating a world that is not designed for us. Better yet, we have much experience with the health care system and have unique insights that could be of benefit to all. Rarely are we called upon for our advice and council. Hence the slogan nothing about us, resonates too this day. Because of the assumption that our lives are not worth living we are subjected to continual attacks. The social supports we depend upon are considered to be wasteful and unsustainable. In reality the fraud rate associated with federal and state support programs is remarkably low. With appropriate social supports we people with a disability can and do thrive. Yet that is not the cultural narrative expressed from the right wing FOX News to the supposedly liberal NPR. No one is asking exactly what sort of services can empower people with a disability to emerge from poverty and become employed tax payers. At present, support programs force people with disabilities to live on the edge of social and economic disaster. This leads me to suggest that instead of forcing people with a disability to fight to retain meager support we ought to guarantee and expand programs that empower us. If we people with a disability were gainfully employed, assured of accessible and affordable housing, and easy access to mass transportation and education the idea that death is preferable to life with a disability could be deemed wrong if not down right insulting. Perhaps what we should be asking is, if these services and supports were guaranteed, and we could be assured that we wouldn't become dependent on our family members for assistance, would people still see disability as a fate worse than death? I think not but change must be accompanied by a ground well of support. That ground swell doe snot exist. Indeed with Trump in the White House vulnerable populations are at the greatest risk I have seen in my life time.